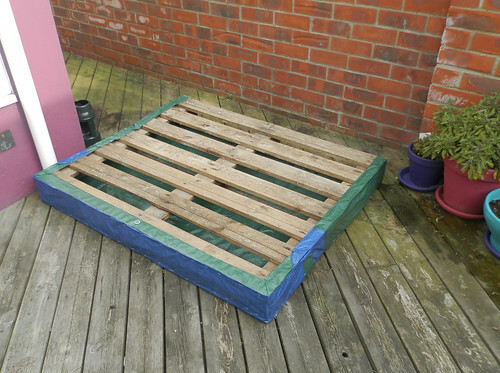 My Pinterest ‘Garden’ board has been brimming with pictures of clever pallet gardens and I’ve been dying to make one for ages. Today I did just that. A couple of months ago I took delivery of a settee and sofabed which arrived on a sturdy pallet, on the kerbside. I was almost as excited about the pallet as I was about the furniture. They took some time and effort to assemble so the pallet project was put on hold for a while. It’s been propped up in the garden all that time and I did get as far as buying a few lobelia trays but then … well you know how it is sometimes, other things take priority. Plus the weather has been very wet lately. 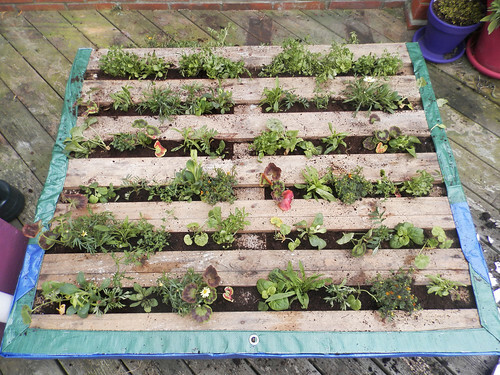 There are a lot of guidelines online for pallet gardens. I followed this one from Life on the Balcony because it had good clear instructions, and good photos. 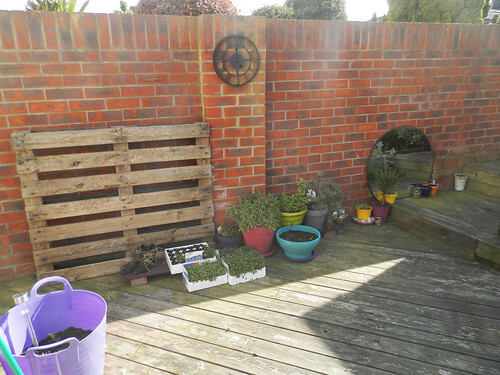 I did deviate from the instructions from time to time, so the following is my own experience of putting together a pallet garden. First confession is that I didn’t sand anything down. I just went for it. 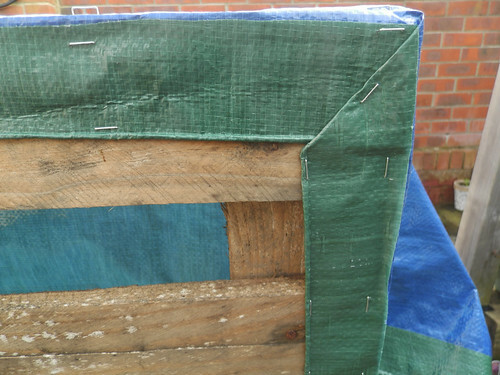 I’m not sure what landscape fabric is, and I couldn’t find any at our local garden centre chain so I bought a small tarpaulin (3m x 2m – bigger than I needed but it only cost £7). I stapled it across what would become the bottom, and worked my way around the frame, stapling, folding and tucking as I went. 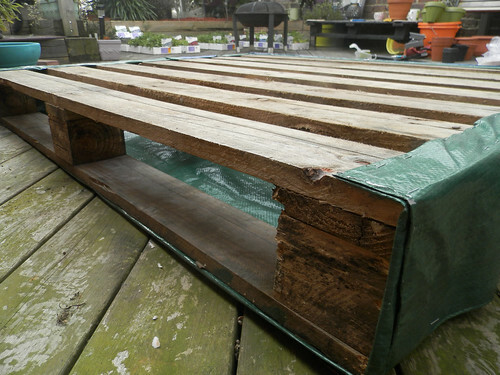 I allowed some overlap to the front of the pallet too – just so the whole thing was secure. As I had a lot of tarpaulin I was able to double back at the bottom where I was worried the weight of soil would accumulate. I went mad with the staples – better safe than sorry. 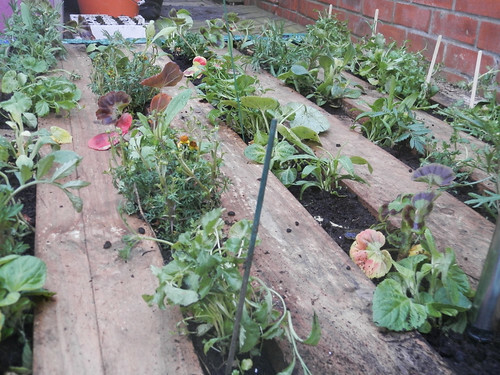 There were only three planks across the back – top, bottom and middle – so I did as much as I could there. Sizes will vary of course. The tutorial I followed suggested two bags of potting compost. I had bought three 60 litre bags. I’d also bought enough bedding plants to cover a small field. I went for what they had and chose things I thought wouldn’t get too big. I’m no gardener so I might get a few surprises. 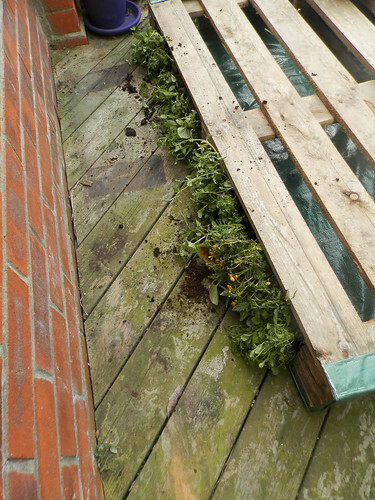 I started by stuffing plants along the top of the pallet. Very random, but trying to keep taller plants to the back. I followed the instruction to jam them all in. … marguerites, marigold, more lobelia (upright and trailing) and a few I’ve forgotten the names of – all crammed in tightly at the top. I then poured in two of the bags of potting compost and started planting. 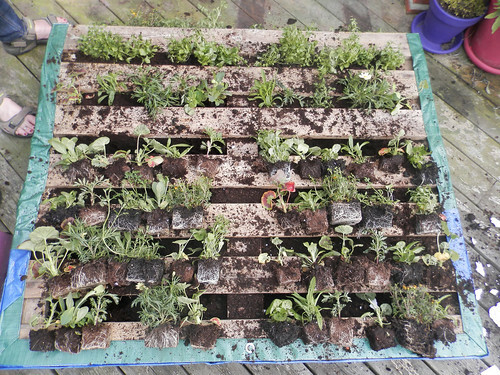 Pallet gardens take a lot of soil or compost. I love lobelia so the second row down was all trailing lobelia – a mix of colours according to the label. After that I went random with everything I had bought (though no more lobelia except one or two fillers – they will go elsewhere in the garden as they flowered ‘forever’ last summer). The tutorial suggested buying six plants for each opening but I think their pallet was smaller than mine. However, even though they said to cram the plants in as tightly as the top, I did leave some gaps. I might regret this when I lift the pallet but we shall see. I have enough plants to plug any gaps if necessary and the upright lobelia could do well here. I randomly assigned six plants to each opening. Some plants had more complex root structures and therefore had wider spaces to occupy. 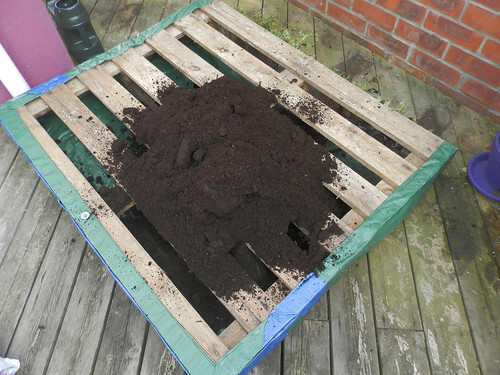 Working from the top down meant that I was able to pack the compost ‘upwards’ as I completed each row. 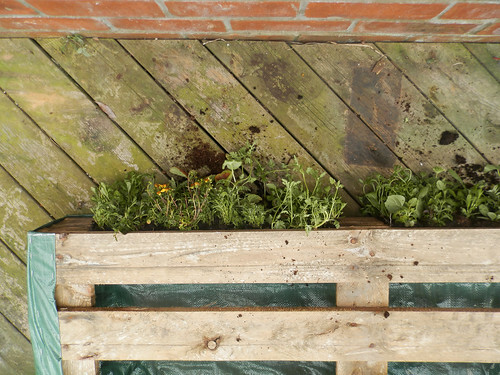 Be careful to stuff compost into the sides and don’t forget the space where the central bar is. I hope I didn’t leave too many gaps or loose areas. And that was that for today. Long and tiring work, so make sure you have plenty of time – and don’t forget to look after your back as you work. I used two and a half 60 litre sacks of potting compost in the end – this will depend on how big your pallet is of course. All planted up – those gaps might need filling too. I’m going to do my best to be patient and wait the two weeks before lifting it into place. Hopefully the regular watering will show any spaces that could do with being filled by more plants, and the roots will begin to form a structure to hold it all together. All that remained to do was give it a good drink and put some sticks in to try to prevent my cat Bob from lying down on it. That, for now, is my biggest worry. It just needs to settle in for two weeks and then it can be lifted into place against the wall. Have you made one of these? Do you have any hints and tips to share – I’d love to hear from you. I will post an update once the pallet has been raised to vertical – why not sign up to hear about updates as soon as they’re posted. I’ve heard a lot of people saying “we haven’t had a summer” and even I have to admit it’s been a bit poor on the weather front. I don’t like the heat so I don’t mind the cooler days, but this August has been quite chilly at times with high winds and cloudy skies. 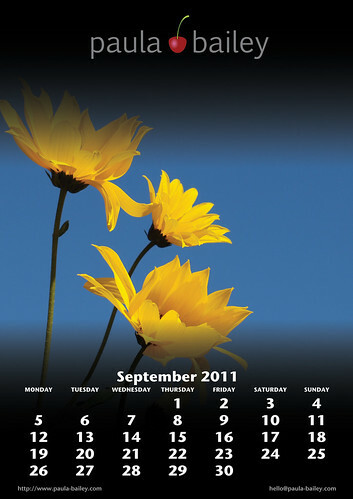 I hope this month’s free to download calendar page will cheer you up a little. You can’t beat bright yellow flowers for putting a smile on your face. You can see more of my photographs on my Bēhance portfolio (as well as some of the floral and decay images from this year’s calendar pages). You can still download the previous months’ pages (see below the main image) and the next one will be out towards the end of September. If you sign up for updates on new posts, you won’t miss it. To download, free to print for your own use, just click on the image below. It seems that everyone’s moaning about the winter at the moment. The problem is, I think, that they started moaning about it in December when we were just getting over Autumn. No wonder everyone’s so fed up. So I thought I’d put out a cheerful and encouraging post today. Spring is on its way! Yes I’ve seen the signs – little flowers are starting to pop their heads through the hard soil and buds and catkins are appearing on trees. Yellow is a colour that is prevalent throughout the spring, summer and even autumn, and yet it is perhaps most closely associated with the onset of spring. It may be because of the “host of golden daffodils” that appear in our woodlands, parks and gardens, and even on the high street outside florists, greengrocers and petrol stations. Yellow is seen as a positive colour. To me it lacks the warmth of orange, but it certainly does brighten things up. On the other hand it can be a warning. We use it on our signs to bark instructions, warn of danger and send out signals at a distance. In nature it can mean poison, particularly when teamed with black. Traditionally its ‘opposite’ (on the colour wheel) is purple or violet, but this pairing often jars the senses. The orange/blue pairing works well, but yellow/purple and the red/green do not seem to share that harmonious relationship. However yellow is complimented well by blue, as can be seen in the centre image of the yellow flower against a blue sky. It’s all about light rather than colour wheels. 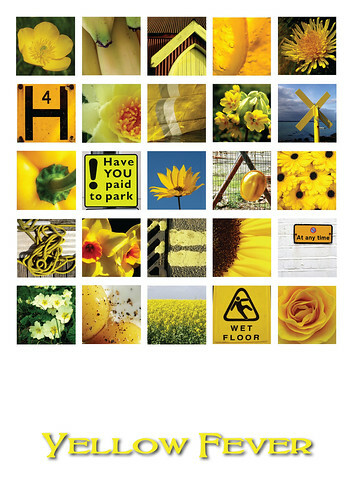 Yellow has a broad range of ‘types’ as with all the colours I’ve discussed so far. It can veer towards orange or to green in hue. It can be a subdued ‘mustard’ yellow (supposedly the fashion colour this season) or scream at us with fluorescent versions. Whichever way you perceive it, you really can’t miss it and I hope you find the collection below cheerful. Spring’s not far away. I have curated a Flickr gallery to accompany this post. Why not sign up for updates on new posts?